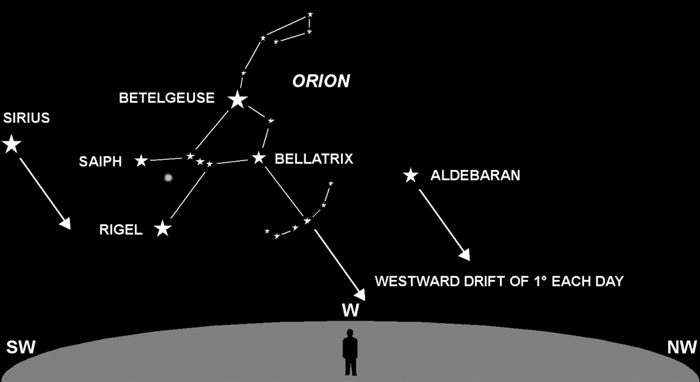 Orion, one of the most easily recognized winter constellations, dominates the western sky after sunset. You can watch “The Hunter” dive for the horizon over the next few weeks. All the stars in the sky move in a synchronized lockstep manner, never changing their positions relative to each other. If you observe the sky at the same time each night, say, one hour after sunset, you’ll see their steady march to the west at a rate of 1° per day. This shift is relative to the Sun or your clock. Since Orion is now about 30° above the western horizon (one hour after sunset), in about 30 days, he will begin to disappear from view. Of course, another constellation will take his place in the western sky — Gemini, The Twins, are next in line in this perpetual progression. This why Orion is known as a “winter constellation.” He makes his appearance on the eastern horizon in late Fall, marches across the sky all Winter, and disappears in the Spring. Not surprisingly, the summer constellations are now rising in the east. If you’re wondering, the reason for this westward drift is the Earth’s motion around the Sun. 360° ÷ 365 days is almost exactly 1° per day. Every day, the direction of “night” changes by this amount.